We also provide software development kit (SDK) for developers so that they can integrate our unparalleled data recovery technologies into their software seamlessly. And with our data recovery services, the qualified engineers in our file analysis center will analyze and recover corrupt or damaged file in any format. 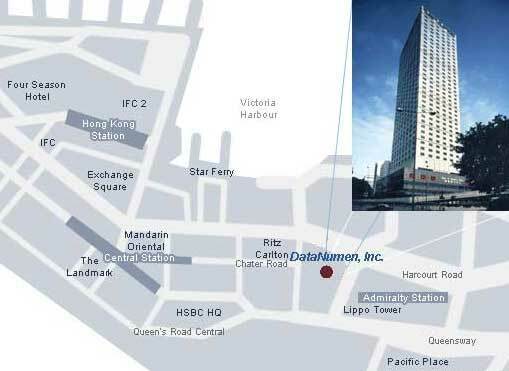 DataNumen, Inc. is located on the 26th floor of the Beautiful Group Tower. This Hong Kong landmark is strategically located at the junction of Central and Admiralty and provides quick access via covered walkways to Hong Kong's core business district, multiple 5 star hotels, restaurants, retail establishments and vital transport links. The Airport Express Station, Star Ferry and MTR stations are all within short walking distance of our office. If using the MTR to reach our office, please use EXIT B from Admiralty Station and follow the signs to Bank of America Tower.